Pro-Choice activists rally outside of the U.S. Supreme Court during Decision Day on June 27, 2016. 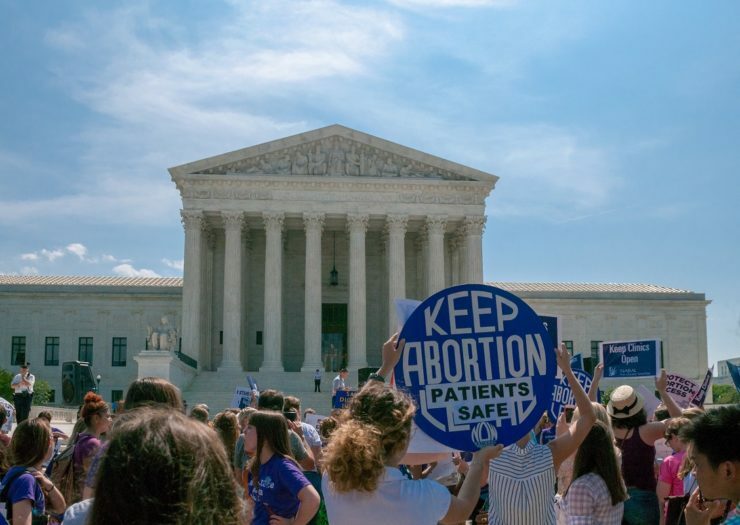 Nearly two years ago, the U.S. Supreme Court decision in Whole Woman’s Healthheld that outfitting abortion clinics like mini-hospitals did nothing to improve patient’s health and safety, although the backers of the Texas provisions had argued otherwise. The Texas law, Justice Stephen Breyer wrote, targeted abortion care for harsher treatment than far riskier forms of health care. “Childbirth is 14 times more likely than abortion to result in death, but Texas law allows a midwife to oversee childbirth in the patient’s own home,” Breyer wrote. Breyer’s example illustrated a stark and unexplored divide between laws governing abortion and other health care. A paper published Thursday in the American Journal of Public Health is the first to systematically examine the disparity. The study team included Sara Daniel of ANSIRH and Lindsay K. Cloud of the Policy Surveillance Program of the Center for Public Health Law Research at Temple University. By combing through laws in all 50 states and the District of Columbia, the authors found more than twice as many TRAP laws compared to laws regulating office-based surgeries. Some 34 states have enacted 55 TRAP laws. In contrast, lawmakers in more than a dozen states with TRAP laws have imposed no regulations on office-based surgeries (OBS), such as liposuction, breast augmentation, and vasectomies. The laws in these states only regulate abortion procedures, the authors found. “It’s very stark how clear the discriminatory treatment of abortion is,” Jones noted. Abortion care, the authors suggest, is subject to strict laws even when no surgical procedure is involved. Eighty-percent of TRAP laws apply to clinics that dispense abortion pills, which does not require surgery. Only 12 percent of OBS laws apply to non-surgical procedures. “It just so clearly is not connected to the nature of the procedures involved,” Jones said. TRAP laws predominate in states with Republican-majority legislatures in the deep South and Midwest, but can also be found in states like New York, the authors noted. Nearly 40 percent of states have both TRAP and OBS laws on the books. Close to a third have only enacted TRAP laws. The team compared architectural and facility requirements in TRAP laws and OBS laws. They found TRAP laws subject abortion clinics to stricter physical requirements than OBS facilities. By comparing a sample of TRAP and OBS laws, the team found 36 percent of TRAP laws required specific widths for doors and hallways, while only 8 percent of OBS laws did. More than 90 percent of TRAP laws required a facility license and 51 percent required a separate recovery room, compared to 16 percent of OBS laws. TRAP laws impose harsher penalties when facilities fail to meet state standards, the authors noted. Ninety-five percent of TRAP laws imposed criminal penalties, fines, or licensing sanctions, compared to 28 percent of OBS laws. “To the extent that TRAP laws reduce access to health care services in the absence of countervailing benefits, they threaten to undermine public health,” the authors observed. HB 2, the strict Texas GOP law that was partially struck down in Whole Woman’s Health, is a testament to this, Jones told Rewire. “In the case of Texas laws, we know from some existing evidence that TRAP laws … stop some women from getting abortions and delay others,” Jones said. Soon after the passage of HB 2, more than one-third of the 41 abortion clinics in Texas either shut down or stopped offering abortion services. Few have reopened, as Rewire reported. The authors urge policymakers and politicians to treat abortion care the same as other health care. Unless wealthy women press the suit, don’t expect favors from the present Supreme Court. Yeah, wealthy women past the age where they have to worry about the consequences for themselves.